Editor: The following post by Annie Lane is nearly 6 years old, and the lifeguards named have perhaps moved on to other beaches. But everything else remains the same – including the old 1980s lifeguard station. This is another in a series of spotlights on the public servants of Ocean Beach. An OBcean can live their entire life in OB and not know who these usually heroic people are – the individuals who work for us. In an earlier post, we interviewed the SDPD Community Relations Officer for OB and the Western Division. Here, Annie Lane takes on the lifeguards of OB. Seasonal Lifeguard Dan House prepares for training rescue exercise. When he finished the program at age 16, he became a pool lifeguard at the Colina Del Sol Recreation Center in El Cajon before joining the team at OB where he is now just one of a few full-time staffers responsible for overseeing all beach activities and rescues. Despite what we’ve come to know through episodes of Baywatch, life guarding is a lot more than slow-motion running in tailored swimsuits down white-sand beaches. Rather, it’s a profession that takes extensive training, discipline and skill to be successful. 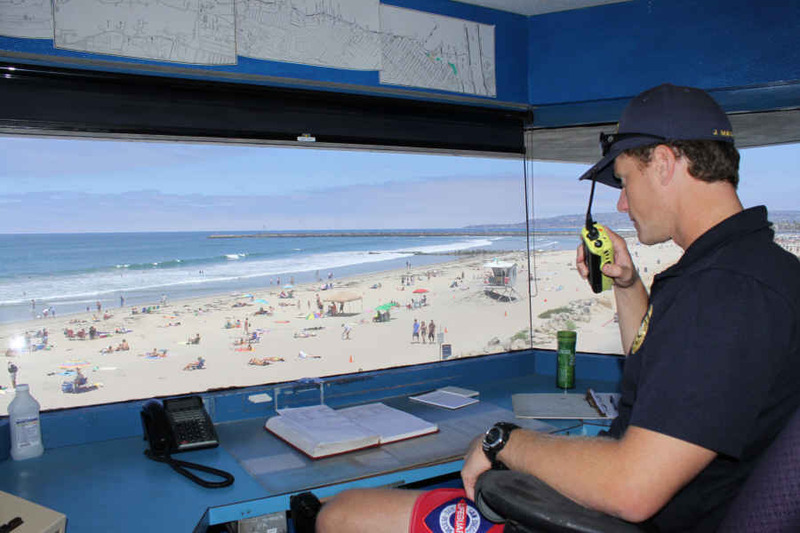 At OB, it all starts with the seasonal lifeguards, the proverbial workhorses of the operation who single-handedly monitor a 400-yard section of water and beach from one of the six towers that spot the beach. In fact, on a hot summer day, one seasonal lifeguard can make anywhere from 40-50 individual rescues in the same area. During a shift, eight hours are spent in the confined beach tower consistently scanning the surrounding area, making precautionary warnings and performing rescues as necessary. For lunch, seasonal guards have two options: relax and enjoy the stress-free hour and a half or, for those who have at least two years of experience, train for main tower certification, an intense position held only by permanent lifeguards. The OB Lifeguard Station’s one truck, ready at a moment’s notice. Permanent lifeguards like Magness have 10-hour shifts four days per week, but are on call 24 hours in the case of emergencies. Of the 10 hours, it is only mandated that they spend 1 hour and 30 minutes twice a day inside the main tower. But this is a daunting task. While up there, they inspect the entire beach for hazards and people in distress, manage the location of the station’s vehicle, Jet Ski, and SUV, listen to two radio frequencies -one that broadcasts updates from the beach and another from the lifeguard dispatch -and monitor a telephone and an intercom system. Seasonal lifeguards who want to make the leap to permanent staff have a long road in front of them, even after they get past the city’s soft hiring freeze. They must complete a rigorous set of requirements, which include 10 hours observing a certified main tower lifeguard followed by 24 hours in the “hot seat” making supervised observations. 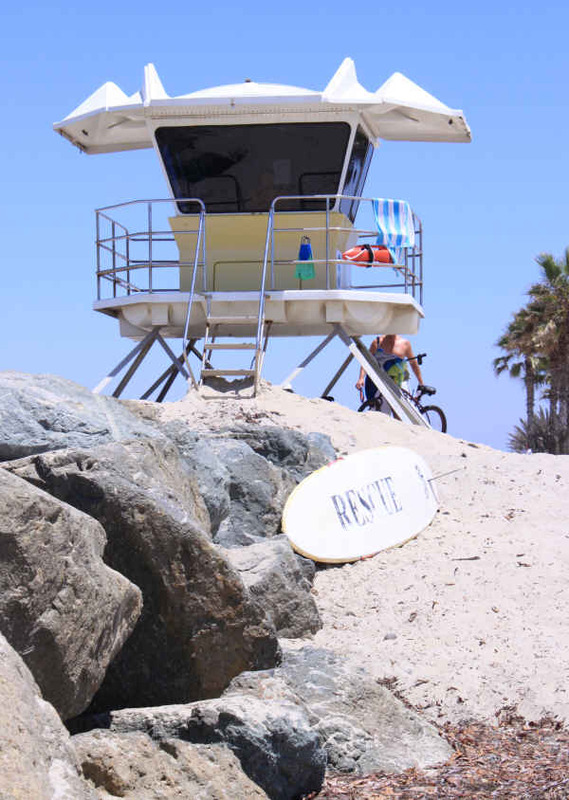 One of the towers on the “front lines” – Lifeguard Tower 5 bordering Dog Beach. Permanent hopefuls must also complete an extensive training curriculum, pass a written and practical exam, have multiple written recommendations and be certified to operate a vehicle, a water craft (such as a Jet Ski) and to scuba dive, each of which have their own in-depth list of requirements. Currently, OB has 18 seasonal and only five permanent lifeguards on staff, a number made considerably lean by the struggling budget and eight staff cuts since last September. According to Magness, permanent positions have remained unfilled and to solve this some seasonal lifeguards – hired each year on an as-needed basis – are asked to take on extra responsibilities to compensate for the staffing shortage. 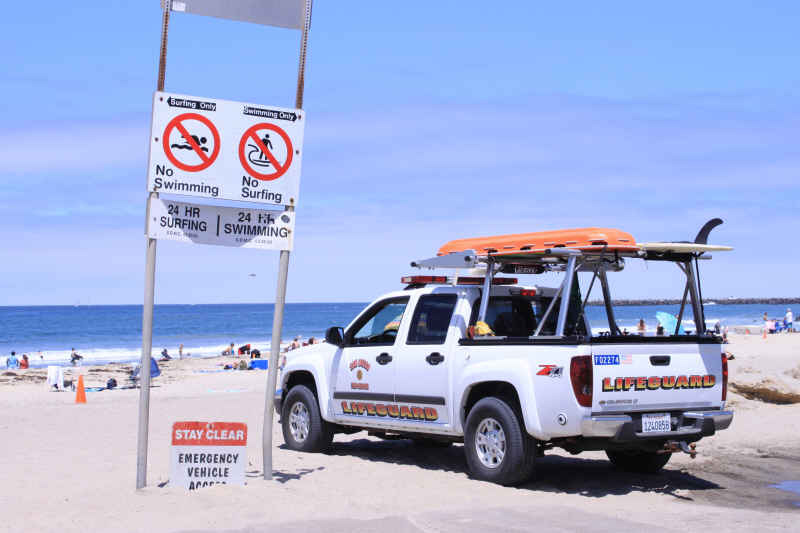 “It’s not safe,” Magness said, referring to the issue that some of the seasonal lifeguards haven’t gone through all the advanced training usually required. In addition, they aren’t offered the same type of job security in regard to benefits and employment protection. 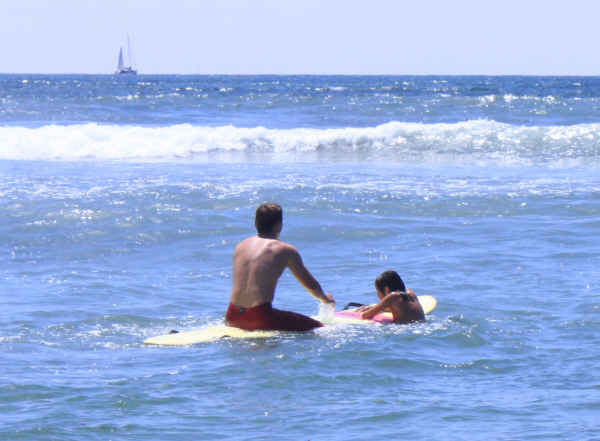 Seasonal Lifeguard Tyler Ball going to rescue a child. While the staffing situation is not ideal, it is born of necessity. 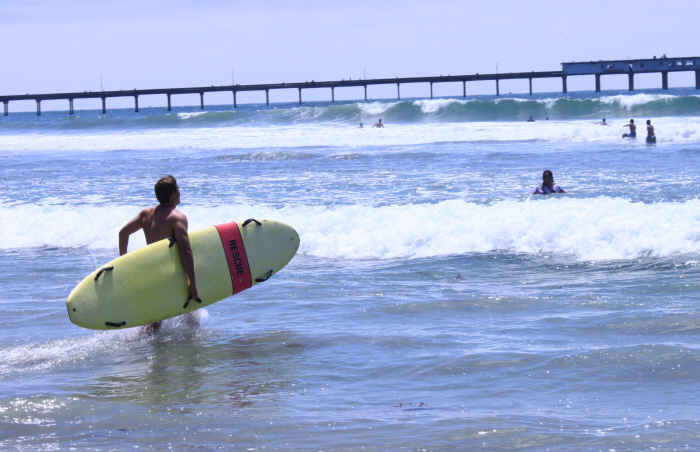 According to the San Diego Convention and Visitor’s Bureau, San Diego has seen more than 2 million tourists each month since March, making it imperative that the OB Lifeguard Station, and all of San Diego’s guarded beaches, meet the population demand and continue to provide their essential services. “A lot of our rescues are people visiting from non-coastal areas,” said Magness, explaining that he can easily tell the difference between local families and those who don’t come to the beach often. Lifeguard Ball reaches a distressed child. Even during the summertime when the beaches are most crowded, Magness said that most rescues go according to routine. “But anything goes out here,” he’s quick to add. And that’s true even out of the water. Having been a lifeguard for several years, Magness is no stranger to traumatic experiences. He still vividly recalls the day a man suffered a heart attack in the La Jolla Shores parking lot and stopped breathing. With the help of Magness and the ambulance medics, the man was resuscitated briefly, but died shortly thereafter at the hospital. 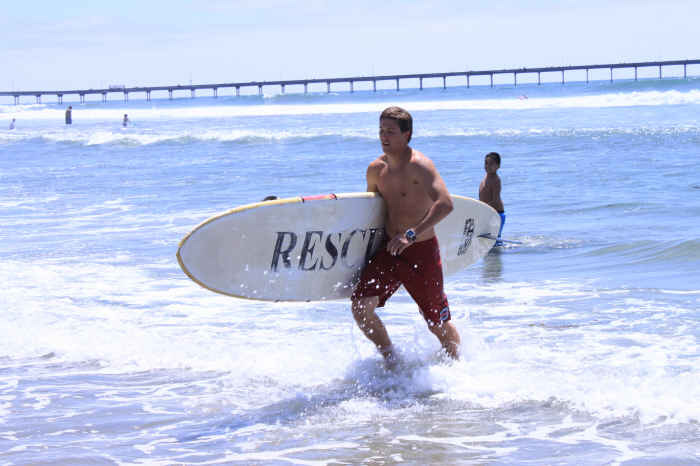 Seasonal Lifeguard Tyler Ball made five rescues in fewer than five hours. But life-guarding isn’t without its share of laughs too, which can help to alleviate some of the stress of a day’s work. This often comes in the form of people who, while under the influence, have a notion to go skinny-dipping and then need assistance getting back to shore. Many times, the rescuing lifeguard won’t know this until they’ve pulled the person into shallow water or put them on a rescue board. Whatever happens out there, whether in the water or on the sand, OB can rest assured: There is a team of lifeguards trained to recognize a dangerous situation even before it happens. A team Magness is very proud to be part of. “It’s the best job you could have,” he said. Great article! I think it is important to highlight the unsung efforts of those that serve their community. Take a pat on the back OB RAG. I also enjoyed the exceptional level of writing in this article. Thanks to all you watermen and women out there watchin out for us.Please write more articles like this one! Robb and kenloc, totally agree with youse guys (maybe you’re a little biased eh Robb? – but no matter) – this is something this blog should do more of…. show that right-wing that wants to privatize every government service the true faces of public service. Thank you Annie Lane for pulling it off. Good job! Agreed with everyone else – nice piece Annie! Who’d have thought an article on lifeguards would be so interesting? I had no idea, for example, about the amount of training or the number of rescues. Thanks, Annie, for a very thoughtful and smoothly written piece on people in our community. I will never look at a lifeguard in the same way again! The photos were a pleasing addition, especially the lead photo from the tower. Right on… this article really puts a face on these public servants. Thanks Annie! I invite any lifeguards who read this to comment and lend your own voice to it, let us get to know you better! Lifeguards are awesome. Thanks for the informative article. This is a great article, some of those lifeguards are smokin’ hot! The OB Lifeguards are the best! In addition, they also give back to the community and talk about beach safety with our CDC and kindergarten classes. Thank you for highlighting them. Very good article. There needs to be more like this. It really annoys me how so many people don’t understand the training and professionalism these men and women have and the dangers they face, not to mention the lives they’ve saved. It crawls under my skin how so many think they just sit there in their tower/station soaking up rays all day and that’s it not a real job. I think is would be great of you can do individual profiles of these unsung heroes and do more features here in the Rag. I think they also get called on for river rescues when Mission Valley is raging, or at least they used to be called on. That’s no picnic either. That’s some serious danger.